He doesn’t sound like an artist. Without a surname he sounds like a character from a child’s game. His paintings don’t look like paintings. They look like price tags. But Numbers is a certainly a work of art. It undermines its own claim to genius, immateriality, aura and transcendence, so in this day and age it must be art. The schtick is this. We the audience decide how much we may be willing to pay and then order one of Simon’s paintings. The result will come back, void of all extraneous detail but the price. Of course, there are still decisions to be made. Should it be on canvas or board? Does a certain typeface lend itself to a certain amount? 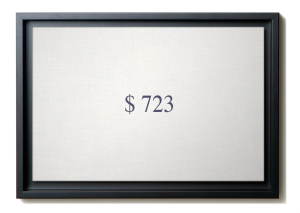 And what of a frame to enshrine your budget? A comments box allows you to influence the specifications. In other words, Simon relinquishes all artistic control. He is subject to the hand of the market the way a shopkeeper might be. The numbers have a twofold dimension. On the one hand they index your commission against all the other, more or less earnest examples of painting out there in the wider world. On the other hand, they personalise the Numbers artwork. Perhaps a house number, a date of birth, even a phone number, each of these values becomes a portrait of the patron. No single number can be ordered more than once, however. And just a word to the wise: £1 billion is already taken. Simon has bought that one for himself (although surely he’s open to offers). Numbers is a neat critique of the market. It is not the first of its sort. But it may be one of the first to mash a crowdfunding dynamic together with an online auction. Days ago I was reminded of Numbers when I saw this painting by Billy Apple at the Scottish National Gallery of Modern Art. In the museum context it leaves you a bit queasy. You too can feel this way for the price of your choosing at the Numbers website.